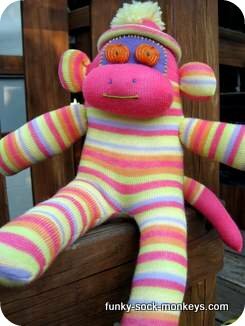 Is this monkey sock doll cute or just funky (odd)? What about those little pumpkin eyes? 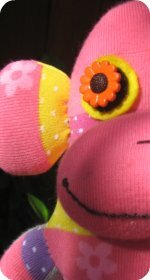 The sockmonkey dolls hat is very sweet but she's still one of our crazy looking monkeys. 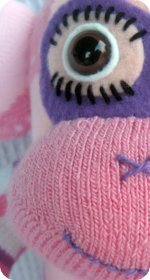 Follow the basic sock monkey pattern. 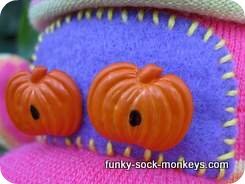 Eyes: Cut a patch of purple felt and stitch to the head with yellow thread, attach pumpkin buttons for the eyes. Ears: Cut small ears, sew and stuff. 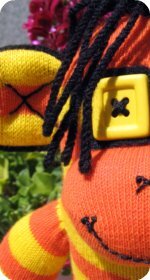 Hat: 3" was cut off the tops of each sock before the monkey was made. The hat is made from one of those pieces. Gather the top and attach a pom pom. 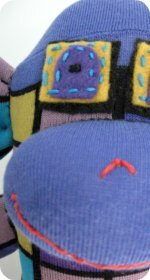 Nose: Make knots with blue thread for the nose and pull them tight, so the knots are indented. Mouth: With green thread create a knot at one corner of the mouth and then create another knot for the other corner about an inch away. The thread between the two knots is actually left sitting on top of the sock. I wouldn't recommend this style mouth if the sock monkey doll is intended to be for a young child. 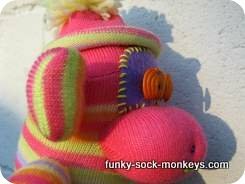 TIP: If you are specifically wanting a cap for your monkey, the vintage sock monkey pattern is the one to use (if you are wanting the cap to be made from socks). 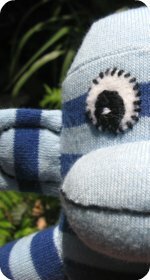 Otherwise, if you are handy with knitting needles, we have knitted sock monkey hat patterns.